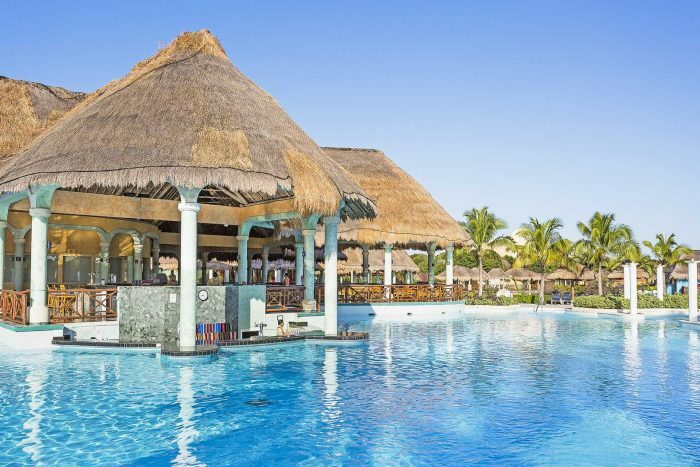 The Grand Palladium Kantenah is a Mayan-inspired all-inclusive resort situated along the Akumal coastline between Tulum and Cancun. The resort is one of a complex with elegant Colonial decor. Beyond the ample wedding ceremony locations across the gorgeously manicured resort, you will find endless restaurant opportunities and impeccable service for you and your guests. 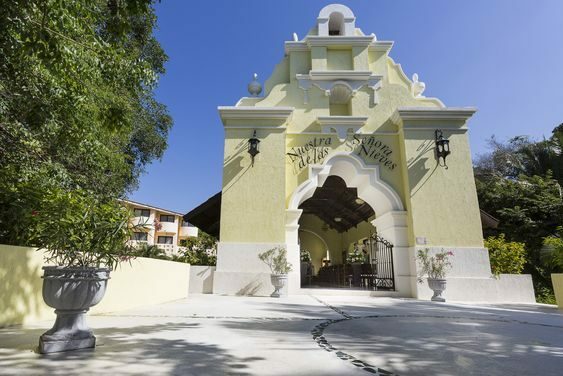 For those looking for an exciting destination wedding, the Kantenah is located in the heart of the Mayan Riviera close to many historic temples, and the resort features gardens, nature paths, and even a kid’s waterpark to explore. The beachfront is unparalleled at the Grand Palladium complex, your guests will have access to both soft sand and rocky coral beachfronts. Your destination wedding could be surrounded by nature, the resort even has natural cenotes on the property. Wildlife like coati and capybara are present and there are exhibits with crocodiles and other creatures. 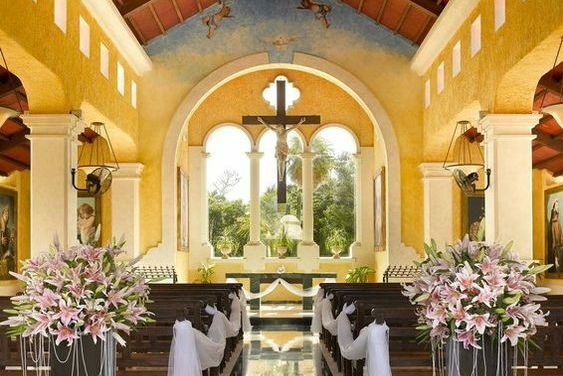 The uniquely beautiful on-site chapel would make for a perfect Catholic wedding ceremonys. For guests not staying at the Palladium or Royal Suites, a day pass must be obtained for an additional charge. Each package does not include the ceremony cost and varies by type of ceremony chosen (Civil, Symbolic, Catholic). Upgraded packages, additional guests, and add-ons are available for an additional cost. 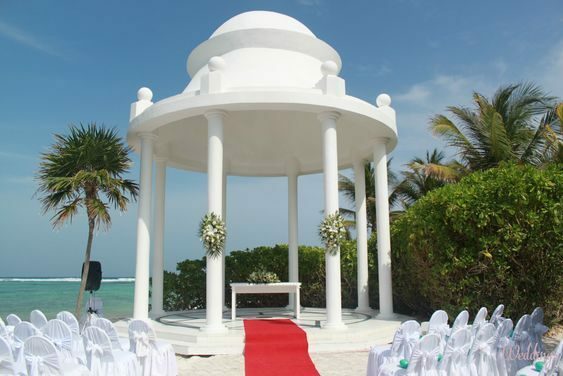 Beach Gazebo – 100 guests max , Pergola – 100 guests max, Catholic Chapel – 80 guests max, Garden Gazebo – 80 guests max. The Grand Palladium Riviera Maya performs a maximum of 3 weddings per day across the multiresort complex. $120 – $200 average price per person per night. Rooms include private balcony or terrace, resort-wide free wifi, and hydromassage bath tubs. Children 2 and younger stay free. There are 422 rooms with resort and partial ocean views. 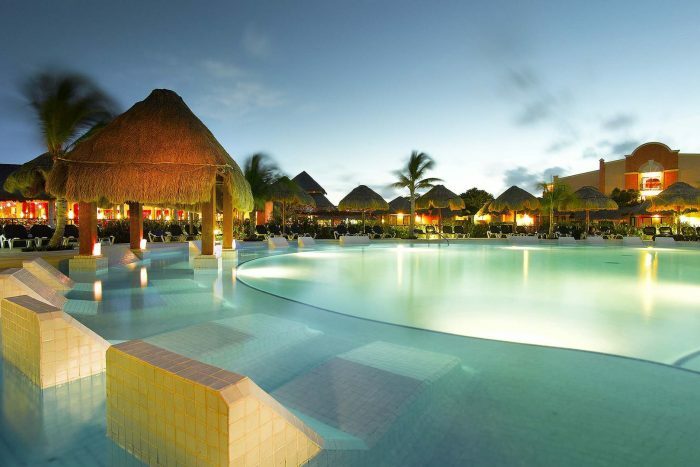 The resort is recommended for more active guests as it’s a multi-resort complex. Your guests will have access to each resort’s bars, restaurants, pools, entertainment, and features within the complex. Shuttle service is available to get around the property. According to the wedding department the busiest times for weddings with the highest changes of sell-out are April, May, June and July. This hotel allows a maximum of 3 adults per room, or 2 adults and 2 children per room. Children 12 and younger stay free. Grand Palladium Jamaica is located about 54 miles from the CUN airport. The Grand Palladium Riviera Maya performs a maximum of 3 weddings per day across the multiresort complex3. Grand Palladium Jamaica is located 54 miles from the CUN airport. “We had a lovely holiday. Food was varied and plentiful. Favorite restaurants were the Mexican and Italian. Enjoyed the adult pool with its beautiful view, but loved the salt water pool on the beach.